500 litre X-Tank, for one or two operators, various filtration options. Please be aware, in order to run the full filtration system effectively a fill pressure of 60psi and over is required. Less than 60psi will damage the R/O membrane and slow filtration time. To counteract this problem a booster pump will be required. To test your mains pressure we sell pressure testing kits for £15 +VAT, Booster pumps and testing kits can be found in the filtration section. Our 500ltr X-Tank system is an ideal size for people who need that extra volume of water to get through the day, or for any 2 man operations that only work 4-5 hours a day. For this 500ltr X-Tank you would need a vehicle with a payload of at least 850kg. Our professional installation service takes around 5-6 hours to complete on these cold water systems, whereas we require a full 2 days for a hot water install. 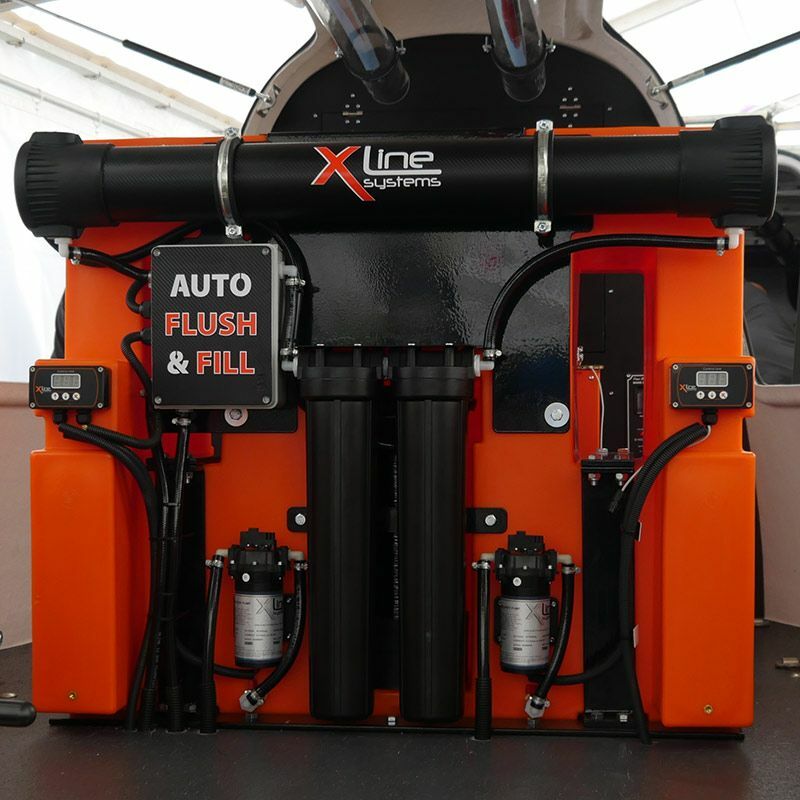 When ordering an X-Tank system you have the option of having the pump controllers mounted on the side or front of the tank, and depending on the vehicle you may have some freedom over where the system can be mounted (forward against the bulkhead, or back towards the rear doors). Available in 3 different tank sizes to suit different vehicle payloads and working requirements. Ideal for people who pre-filter their water via a static system. 11 ltr D/I. Ideal for people in soft water areas (below 100ppm TDS), or for people who need lower volumes of pure water. 2 x 20" Pre-Filters, 40" Low Pressure R/O Membrane, 11 ltr D/I. Ideal for people in hard water areas (above 100ppm TDS), lower running costs and less maintenance. Single or double controllers & pumps to accommodate 1 or 2 WFP operators. Allows you to operate the system via the vehicles side door or from the back of the vehicle. Completely kit our your vehicle with everything that you will need. We offer a range of metal hose reels that will easily accomodate 100m of our 8mm Orange Hose. We offer a fantastic selection of rigid & lightweight water fed poles along with our popular range of lightweight durable brushes. We can also install our WFP Storage Tubes to keep your pole safe and secure. If you want to free up some additional floor space, and have the ability to reel in your hose and chest height, then take a look at our raised reel platforms with optional underfloor guides. Add an optional Gas or Diesel hot water unit to your X-Tank System. Cheaper than a gas unit, but with higher running costs. Temperature will fluctuate during use. External exhaust or flume required. Gas bottle will need manually replacing once empty. Available with either 5.5kw or 9.9kw diesel burners for either 1 or 2 operators to work all day at a constant set temperature. Optional Lower running costs, more efficient & safer compared to gas hot water systems. Specifically designed to house all the electrical & filtration components within the tank itself. We did this in order to reduce the overall footprint of the system and to reduce the risk of components getting damaged during everyday use. Easily Fits into most vans. Designed to easily slide between a vehicles wheel arches. Because these systems utilize a smaller footprint compared to other systems on the market, you can carry more equipment with you. Due to the design, these systems are lighter than other systems out there, mainly due to how all the components are fixed directly to the tank itself, so no need for heavy metal fixing plates or wrap around frames.